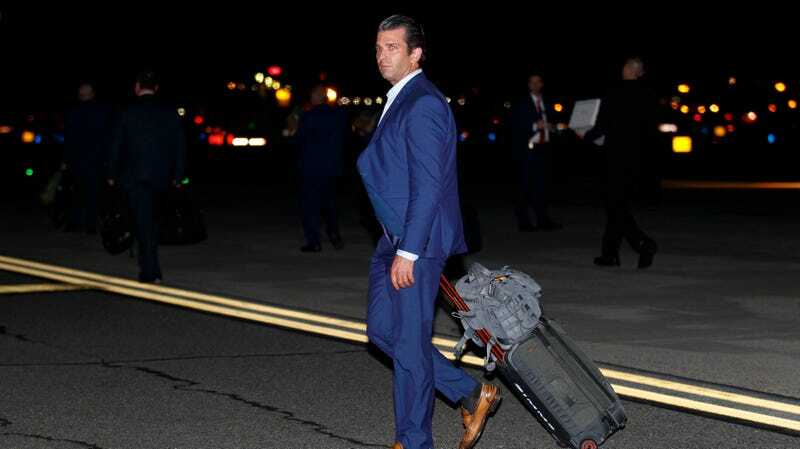 It’s been a while since I’ve checked in with Don Jr., the Trump son with the smallest chin and largest collection of stupid eyewear, and I wonder what he’s been up to? Oh, according to a leading Spanish prosecutor, the FBI has obtained some interesting wiretaps between Spanish police and Alexander Torshin, a Russia Central Bank official who has ties to the National Rifle Association and Don Jr...and things are maybe not looking good for the latter? The report is too vague to conclude anything, but perhaps it will inspire Don Jr to once again leak incredibly incriminating emails of himself, thereby delivering a wonderful gift to Special Counsel Robert Mueller. What else is going on with Don? Let’s see. Oh, together with the second-most dimwitted Trump son, Eric, he blew through $250,000 in public money in a single month, most of which was spent on a trip to open a Trump brand golf club in Dubai. “The Secret Service documents, received through Freedom of Information Act (FOIA) requests, shed light on how much taxpayers are paying for trips taken by the heads of the president’s private business empire,” the watchdog group Citizens for Responsibility and Ethics in Washington said in a statement. Ah, what else? He apparently went on a luxury vacation in France, where he did a lot of making out in public. How nice.